Last night Ghost headlined the iconic Royal Albert Hall in London in grandiose fashion. The venue is of course steeped in history, not only for the countless era-defining artists that have graced the stage, but for the jaw-dropping decor and the acoustics of the room itself. 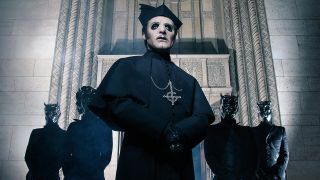 Now performing as a seven-piece, the Ghouls, Ghoulettes and Cardinal Copia graced the English capital with a whopping 24-song set split into two acts. Spanning the length and breadth of their back catalogue, much attention was paid to latter two albums Meliora and Prequelle, including a bombastic Rats, an anthemic Dance Macabre and ludicrously fun Miasma – complete with Papa Nihil on saxophone solo. Ghost have just announced a A Pale Tour Named Death tour of Europe for early next year, and if online rumours are to be believed, this is the set they'll be packing in 2019. We'd like to watch it again right now, please.